Embassy Suites Tampa – USF is located at 3705 Spectrum Boulevard, Tampa, FL 33612. Their telephone number is 813-977-7066. The Summit will be in the USF Marshall Center’s Oak Room (MSC 3707) on the third floor. Map of USF Marshall Center. USF’s Marshall Center is an easy walk from the Embassy Suites. Walking Map to USF Marshall Center *The walking map begins at Alumni Drive. From the Embassy Suites on Spectrum Boulevard, you will need to navigate through parking lots and grass to reach Alumni Drive. Embassy Suites offers a free shuttle anywhere on campus. Inquire at the front desk and allow 10-15 minutes extra if you plan to take the shuttle. 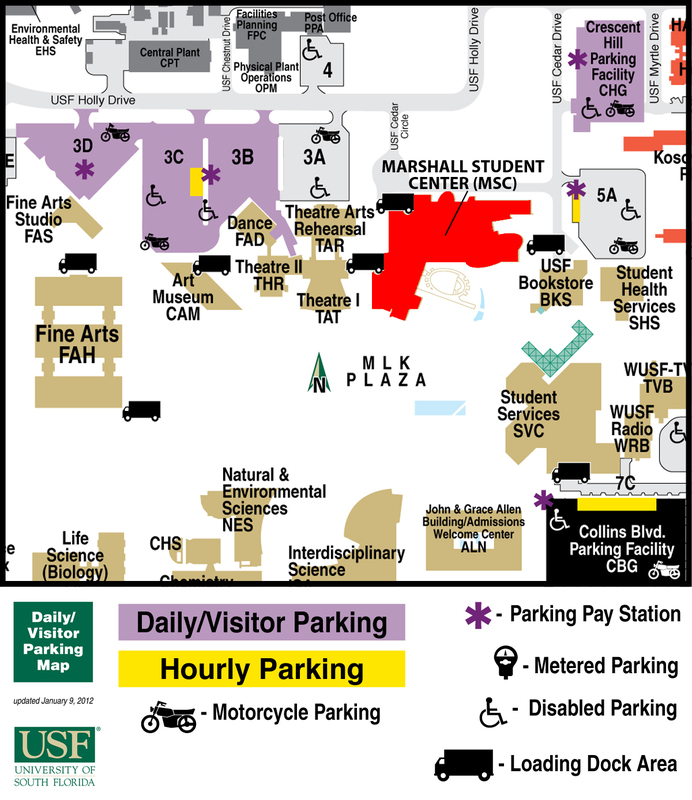 Visitor Parking Map *The USF Marshall Center is in red on the map, and the designated visitor parking areas in the Crescent Hill Parking Garage, Lots 3B, 3C, or 3D are purple. Parking passes need to be picked up at the Campus Information Center, circled in green on the map. Note: Embassy Suites is not covered by the USF Smoking Policy, but may have its own policy.